At Dassault Systèmes, much of the work we are doing in the mining industry is now based on the 3DEXPERIENCE Platform. The 3DEXPERIENCE Platform is a unified, collaborative ecosystem that can be used in cloud environments managed by Dassault Systèmes or on-premise at a customer’s site. This allows users to create and work with 3D Models and centralized data in a variety of ways in a secure, version controlled and audited environment. Understanding the concepts behind this environment helps many organizations to make radical changes for the enhancement of their businesses. Mining has much to gain from the connected flow of data between parts of the organization and the wide variety of applications already proving valuable in other industries. The 3DEXPERIENCE Platform is represented by the compass logo defining four sets of applications that can be used for business-critical functions. The North quadrant of the compass represents social and collaborative applications. These can be data stores, blogs, project management tools and dashboards that allow users to communicate effectively. In the East quadrant, we find Information Intelligence applications. Here users can create search-based applications and dashboards which can link to data stored on the platform, on the web or in 3rd party applications like SAP®. In the South quadrant lie manufacturing, simulation and virtualization applications which allow us to learn from and optimize processes using virtual twins before trying them out in the real world. Last, but not least come the 3D applications in the West quadrant. These tools allow visualization of 3D environments which allow construction and modelling above and below ground. GEOVIA applications like Surpac are now equipped with capabilities to allow them to take advantage of the 3DEXPERIENCE Platform. The POWER’By feature which has been made available in the latest version, allows users to synchronize their data directly to the 3DEXPERIENCE platform and take advantage of the many applications available in this space. Furthermore, giving access to users across the organisation allows the removal of silos between departments and creates an environment where for example, status reports, KPIs or project management tasks can be shared. 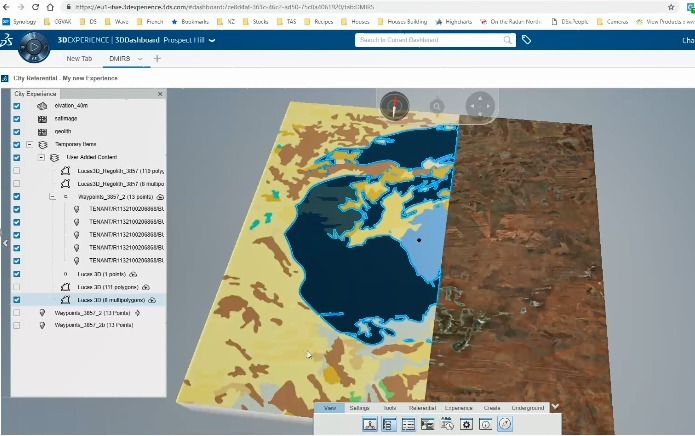 The 3DEXPERIENCE Platform then opens up a plethora of opportunities in terms of 3D visualization, geospatial mapping, business analytics and engineering tools as well as simulation and optimization techniques that can work on centralized data. The ability to define and optimize in the virtual twin of the mine allows experiments and testing to be conducted in the virtual world that can eliminate errors and improve safety in the real world. If you would like to try some of these features out for yourself, you can obtain licenses for the 3DEXPERIENCE platform roles from your local GEOVIA Sales Representative. Charles is a Geologist with 30 years’ software experience across a range of industries from telecommunications and finance to high tech and government. Over the past nine years at Dassault Systèmes, Charles has served in several positions across GEOVIA R&D and participated in project implementations from Mongolia to India and New Zealand to South Africa. In his current role, he provides technical support to sales channels. In his spare time, he enjoys trekking and playing the grand piano.